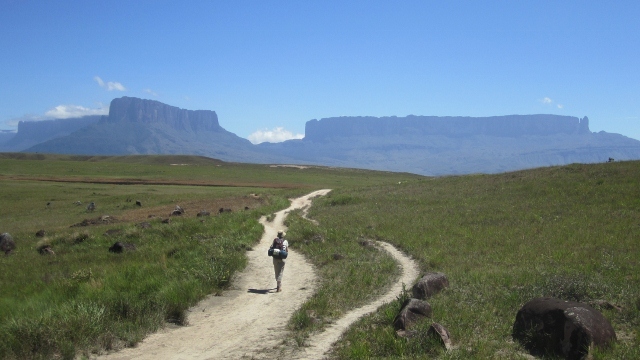 After our adventure on Monte Roraima we were ready to explore the rest of Venezuela. 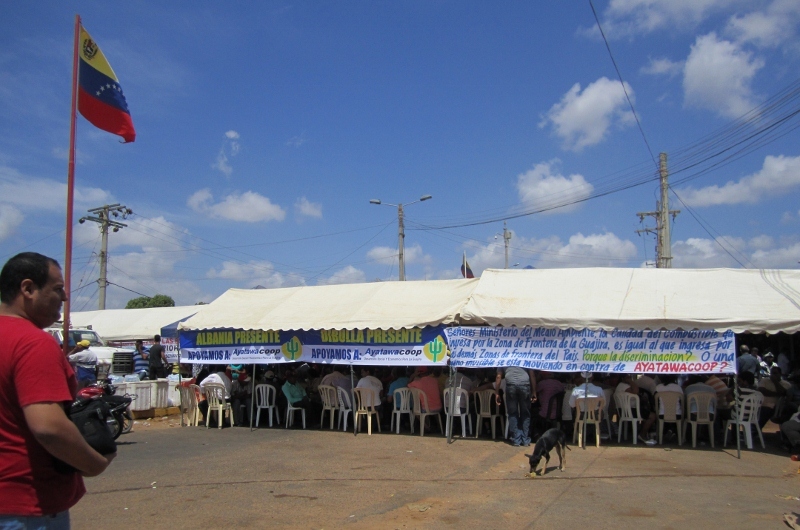 From the tepuis and La Gran Sabana, we moved north to Caripe and sites around the edge of the Orinoco Delta. From there it was north to the Paria Peninsula, then west along the north coast to sites in the northern cordillera (near Caracas), west into desert country near Coro in the state of Falcon, then south into the Andes all the way to Tachira. 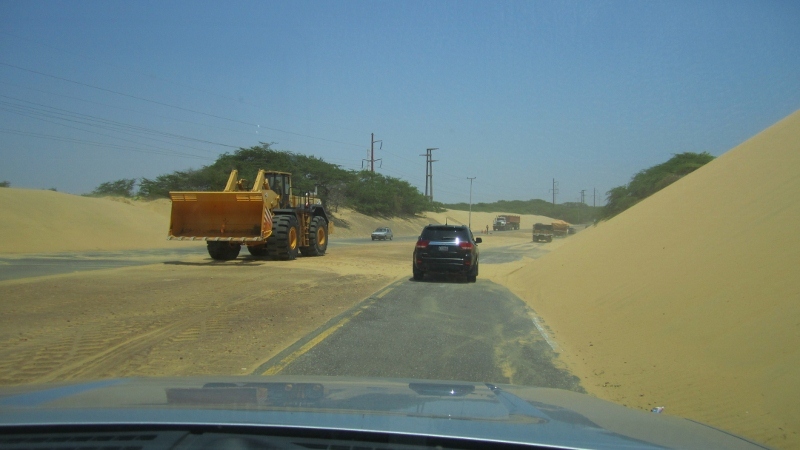 Finally, we worked our way around Laguna de Maracaibo and to the northernmost border crossing with Colombia on the Guajira peninsula with a day left on our Venezuelan vehicle import permit! With all this tearing around, and Venezuela's less-than-reliable internet availability, we have not been able to get to an update in a long time, and deal with this period of nearly two months in just this one update. In addition, we were preoccupied with more important things. Anne's mom Sallie had been in remarkably good health (given the circumstances) when Anne visited a few weeks earlier, and they had been able to spend some good time together. Sallie declined rapidly after Anne left, and on 31st March we learned of her death the previous day. Although still a great shock to us, with the benefit of hindsight the speed and peace of her passing was best for her and all involved. She was the biggest supporter of our travels; we still can't really believe she won't be there to welcome us back in a few weeks time. She had a soft spot for Latin America (having lived in Mexico for some time in the 1960s) and she lived vicariously through us, something of which we were always very keenly aware. She loved our blog updates, and as her illness progressed, enjoyed having them shown to her by Anne's brother Michael. Consequently we often wrote about quirky topics that we knew would specifically be of interest to her, and here we continue that tradition. This photo taken at one of our favorite campsites high in the Sierra de Lema (on the northern slope of La Gran Sabana) says a lot about the environmental situation we have witnessed in many Latin American countries. We have encountered many amazingly beautiful and biologically rich areas, but they are often accompanied by a sense of pending ecological decay (or at least dumped rubbish or rusting cars). 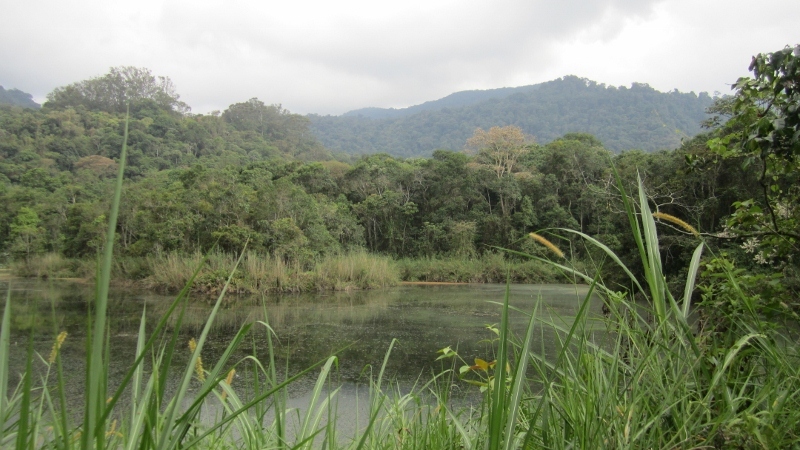 Our first destination in the north was the Caripe valley and its few remnant patches of forest on the adjacent hills which support several very restricted-range endemics, such as Grey-headed Warbler. One of the birding attractions is a very accessible cave that supports a population of Oilbirds, one of the species we talked about in our Roraima posting. 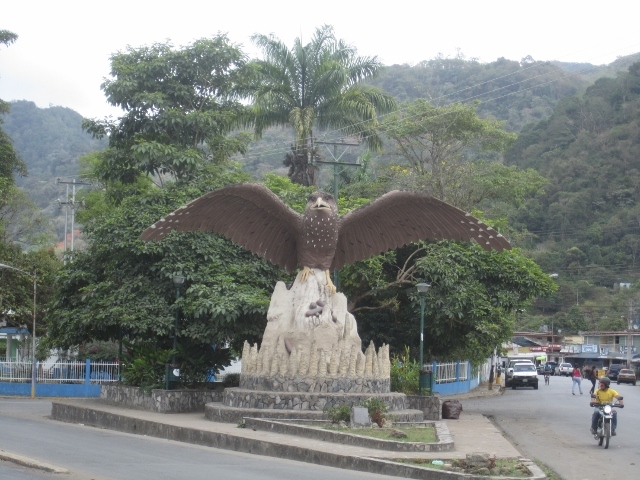 The area is relatively touristy and they have chosen to highlight the attraction with a giant Oilbird statue at a prominent road junction. 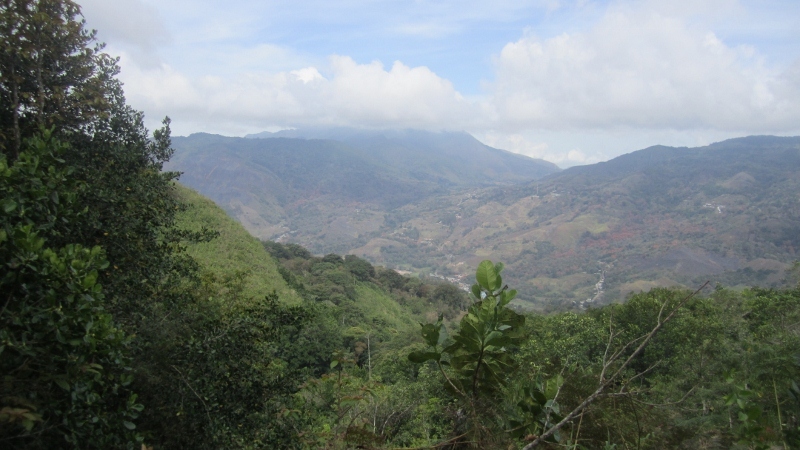 Above is a view of the Caripe valley and surrounding slopes from the trailhead at a “new” site we found where we had great luck finding our target birds. 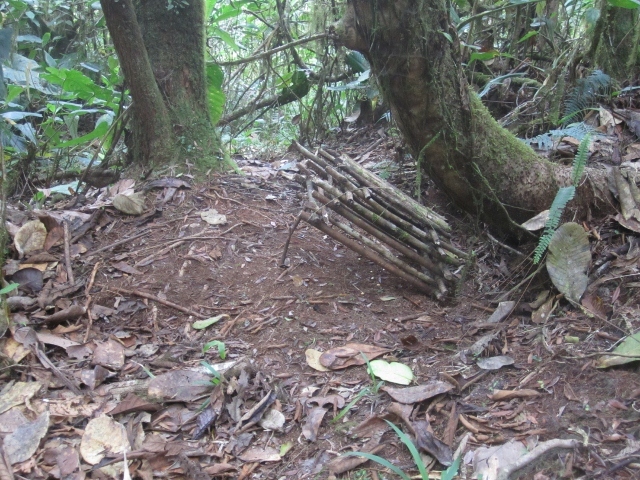 In addition to the continuing loss of forest cover that threatens these species we found very real evidence of active bird trapping when we stumbled upon a number of traps (below). These are designed to capture ground-dwelling birds, such as the Lined Quail-Doves we found in two of them. We were well aware that making a living and finding food is difficult in rural Venezuela and we were reluctant to interfere, but it was impossible for us to walk past trapped wild birds, so we released them. 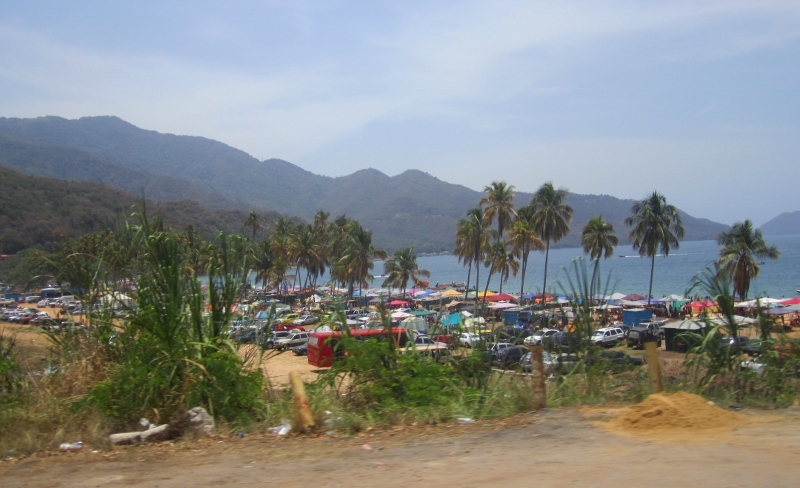 We always do our best to avoid areas where people amass during holidays, but nonetheless we found ourselves traveling toward Caracas on the final weekend of Semana Santa (Easter Week), probably the most popular Latin American holiday of all. Venezuela is clearly not a markedly religious country, and Easter seems to be all about the beach. The traffic was incredible even hours away from Caracas, apparently because the entire city vacates to the northeastern beaches for the week. The photo above shows one of the many jam-packed beaches we passed on this beautiful coast. East of Caracas the coastal region is very arid and the deserts support yet more localised endemic birds such as Yellow-shouldered Parrot and Maracaibo Tody-Flycatcher. A primary feature of the northwestern coastline is the Araguana Peninsula, separated from the mainland by a very narrow neck dominated by sand dunes. The strong onshore winds and large amount of sediment in the offshore waters result in a continual accumulation of sand that requires constant attention to keep the peninsula access road open. We eventually left the north coast and headed to the southwestern region of the country, which is dominated by the northern extent of the Andes. It was a welcome return to these amazing mountains in which we had spent almost all of 2011. Our first stop was at Parque Nacional Yacambú (above), a relatively low-elevation park on the east slope near the northern end of the range. We were warmly welcomed by the park staff who let us camp inside the park HQ for a whopping $1.25 per day. It had excellent birding, including several key endemics, the best of which was Great Antpitta. 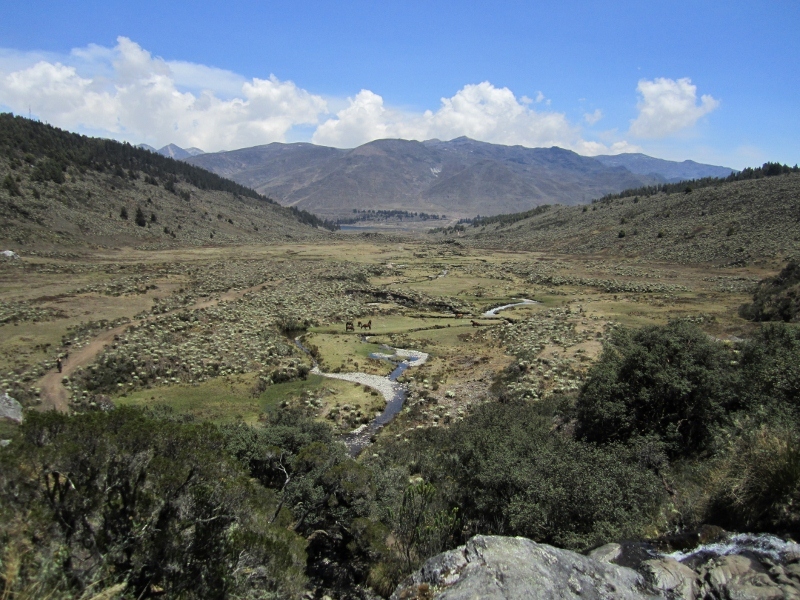 As we headed further south into the Andes, we found ourselves back in high elevation paramo, searching for several very localised endemics and camping in the chill of 4,100 meters (over 13,000 feet)! It was at this inopportune time that we discovered our trusty heater in the camper was no longer working. We weren’t too surprised, given it had been about 18 months since we had last switched it on. Nonetheless, the scenery matched the great birding, as you can see in the photo above from Mucubají and below from Paso Aguila, both in the state of Mérida. Our plans were temporarily thwarted when we arrived at our next destination, the Parque Nacional Sierra Nevada just outside the city of Mérida. Here we discovered the park was closed for the next three days to accommodate the presidential election following the recent death of “Comandante” Hugo Chavez. We had specifically selected this destination because we wanted a quiet, secure place in case things got out of hand during the election. 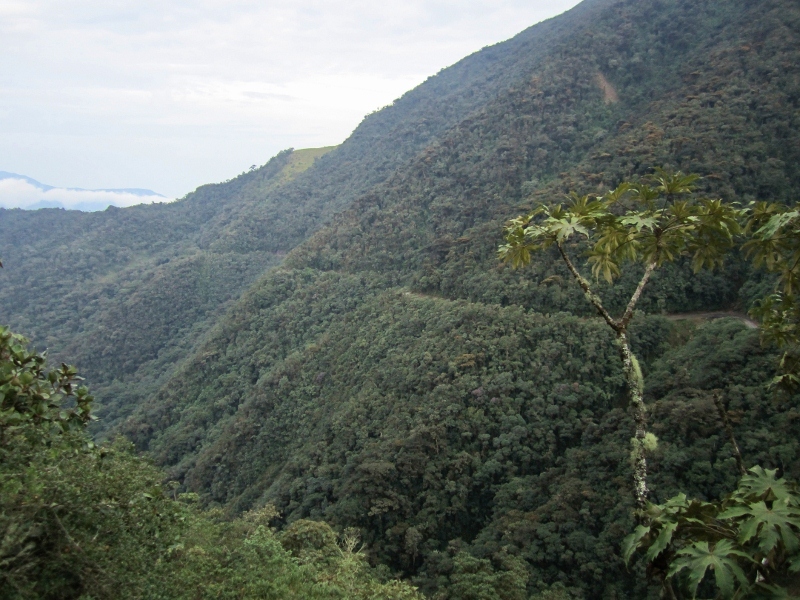 Our backup plan took us to the beautiful Andean forest of the state of Táchira to the south. 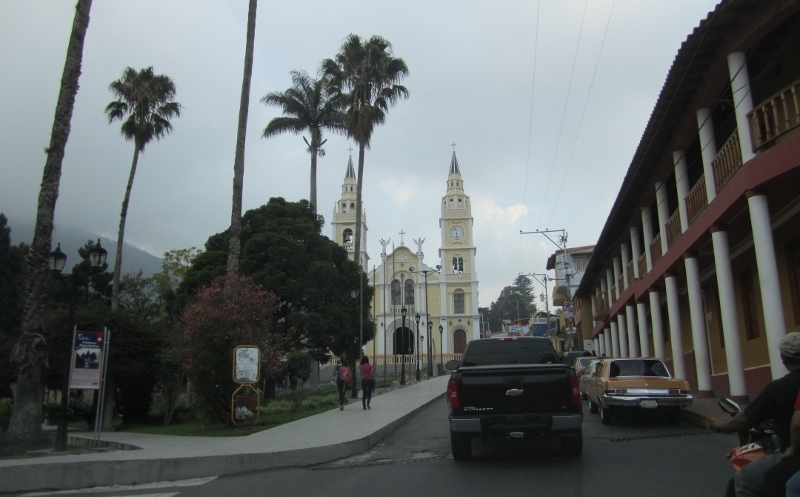 We passed through several lovely small Andean towns with the obligatory plaza and church (above) and enjoyed being back on narrow, seldom-traveled roads (below) that wind their way through forest packed with great birds. 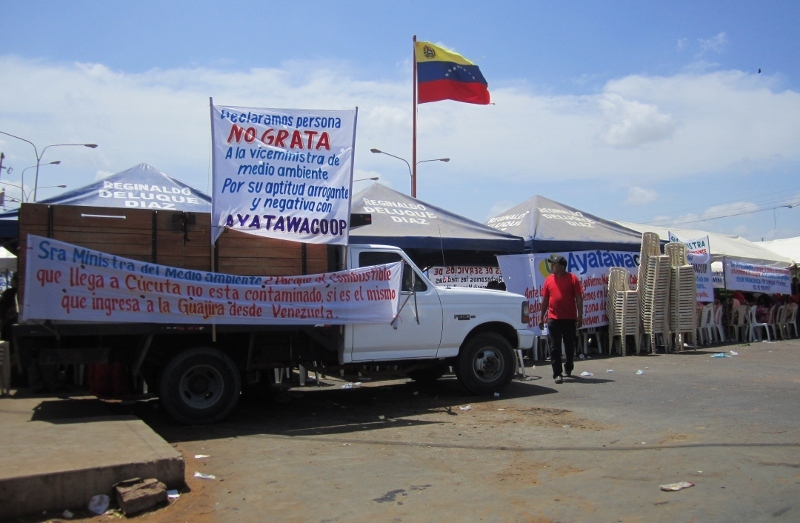 Here we knew nothing of the election result, until we returned to Mérida a couple of days later and saw obvious signs of heated demonstrations. No we haven’t just crossed to the UK and found ourselves driving on the wrong side of the road, despite appearances. We found the car in the picture above driving backwards on our side of the road, clearly suffering from a major transmission problem that left him with only reverse gear. But in Venezuela something trivial like that is certainly not enough to keep you off the road. One thing we both really loved about this country was all the old American-made sedans. At times it felt like we were driving around the US in the 1980s. Particularly popular were Chevy Malibus from the 1980s, but there were all sorts on the road. It was very reminiscent of Cuba except with cars from the 1970s and ‘80s rather than the ‘40s and ‘50s. Of course most were in less than stellar condition but they found a way to keep them running, mostly as taxis. There were large areas of rural Venezuela where we appeared to have the only vehicle on the road with a full set of working lights (and we’re not exaggerating). The guy above may not have a working gearbox, but at least he has two headlights! Finally we reluctantly made our way to the border with Colombia, right back where we started our South American circuit. Despite dire warnings from the handful of fellow travelers we knew who had spent time in Venezuela, we had had a remarkably trouble-free time in this great country. Predictably therefore, our 36th and final terrestrial border crossing was to be the most problematic. In general all of our crossings have been free of major challenges, and particularly in South America they have been very quick and easy. It all started after we had checked out of Venezuela at the immigration office and proceeded to drive toward the border, where the Venezuelan police assured us it was shut and could remain so for several days! We pulled to the side of the road and parked so Jon could walk up and get the story. It was in fact very much closed, not by government officials but by the hundreds of Colombian protesters physically blocking both sides of the roads. Above and below, the disheartening view that greeted us on arrival at the Venezuela-Colombia border. 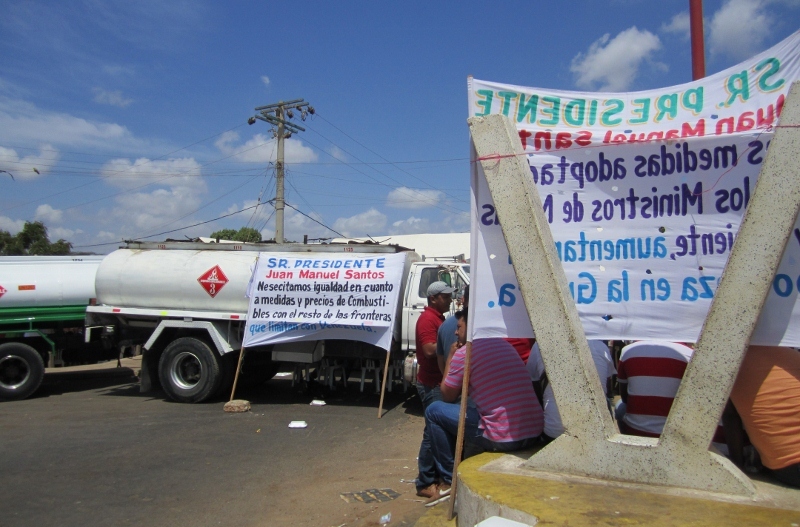 Apparently the local indigenous group was protesting about the price and quality of fuel being sold to them by the government for distribution by their local cooperative. Word on the street was that they were waiting for the Environment Minister to arrive and if he didn’t come they planned to stay in place for at least five days! We were obviously a bit dismayed by the prospect of being stuck at the border, but we didn’t panic and figured we would just wait and see what happened. As we were standing around contemplating our options, Jon overheard some locals talking about a minor back track through the desert scrub that could be used to bypass the blockade and enter Colombia unofficially. 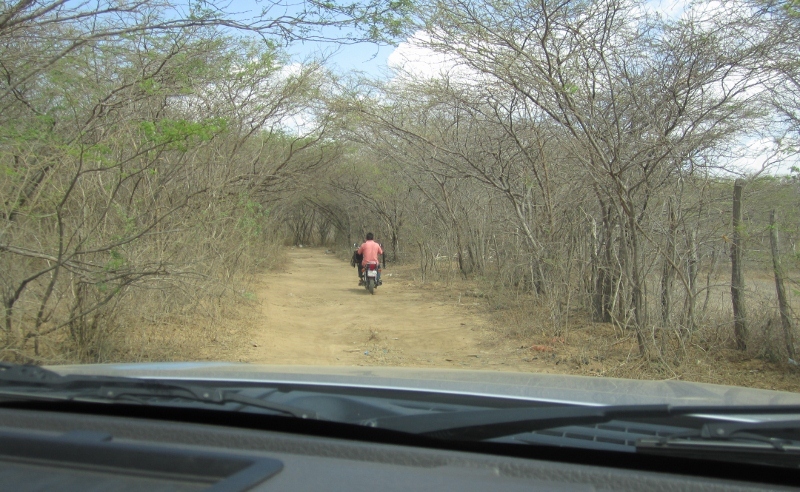 Thinking fast, for the equivalent of a few dollars we hired a guy on a motorcycle taxi to show us the way (above). We encountered four informal “gates” along the route where enterprising locals had strung ropes across and were charging for passage, the price rising at each gate as we got closer to Colombia. But in the end we arrived safely and emerged in the Colombian side of town, right across the street from immigration and next to customs. None of the police officers that saw us come through seemed to care at all about our less-than-legal crossing but we were quick to make our way to the various offices to get ourselves and the truck officially checked in. Some officials were a little surprised to see us, but they avoided asking any awkward questions. 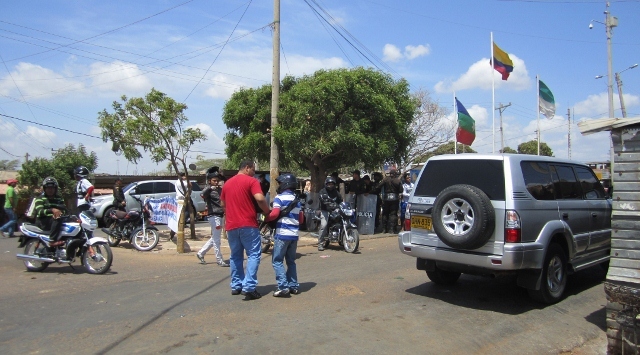 In any case, the environment was relatively calm, as you can see by the contingent of fully armoured Colombian riot police ready if needed but staying cool in the shade of one of the few small trees (below). We even asked one of them to keep an eye on the truck while we got our paperwork done! With paperwork in hand, we were finally ready to beat a hasty retreat. 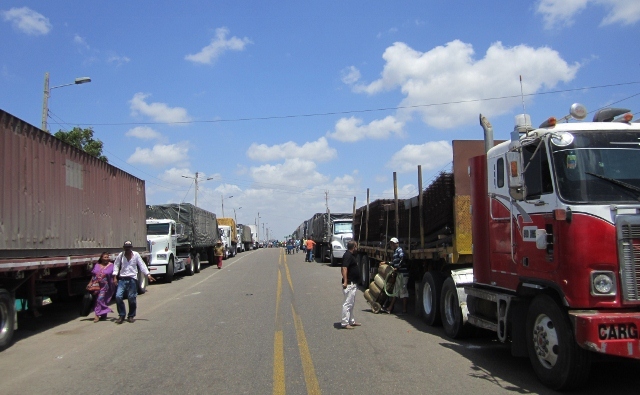 We were glad not be one of the dozens of frustrated truck drivers waiting to deliver their cargo across the border (above). 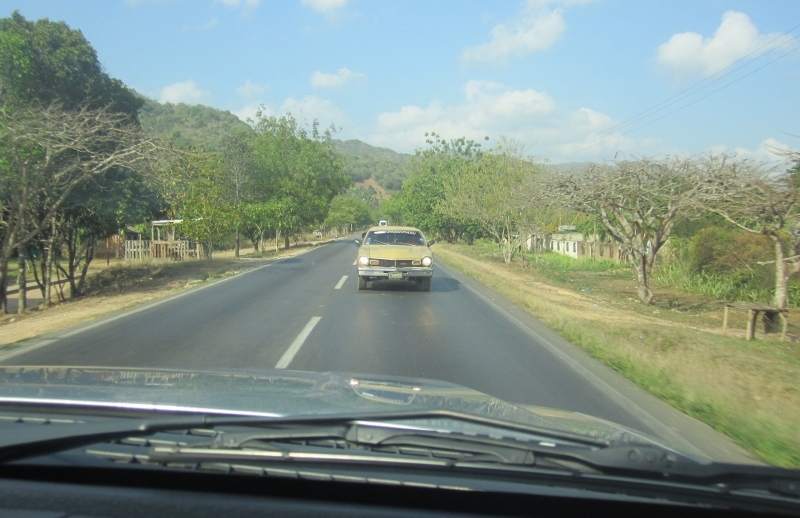 As we drove away we were reminded of one of the many things we would miss about Venezuela – the cost of fuel. 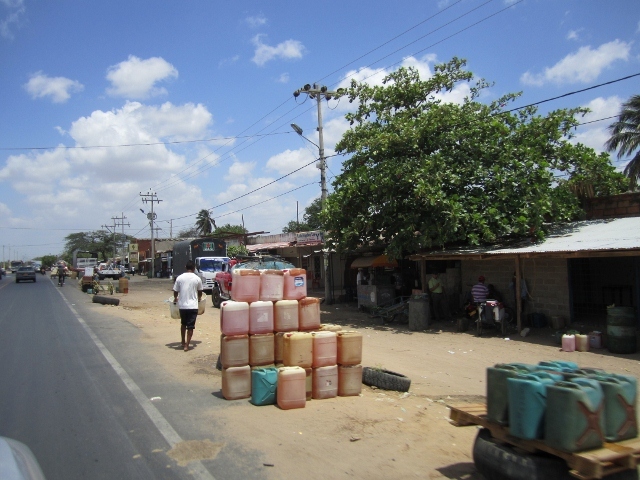 Despite efforts to control the passage of cheap Venezuelan fuel across the border, people still find a way to smuggle it - probably along the sort of back route we took - and it is readily available at the side of the road in Colombia (below). It is hardly surprising that such smuggling is rife: in almost three months in Venezuela we purchased 1049 litres (276 US gallons) of petrol at a total cost of 83.20 Bolivars (US$ 4.22). It costs more than that for a single gallon in Colombia. Once Anne flew back from California in early March, we returned to La Gran Sabana where we had spent our first week in Venezuela back in early February birding the forested slopes of the Sierra de Lema. 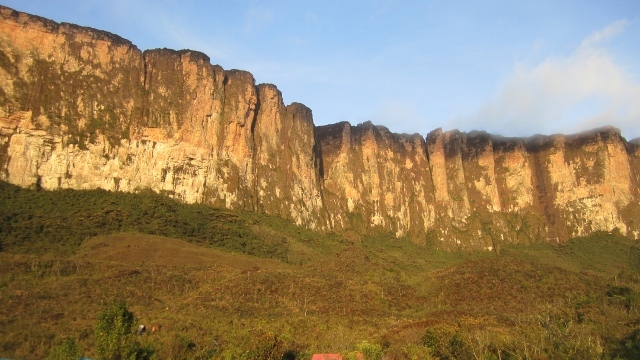 Although we found many tepui endemic birds here, we really wanted to find the highest elevation tepui specialities, for which the best solution was the 60km round trip hike and ascent of the tallest and most famous of the Bolivar tepuis, Monte (or Cerro) Roraima. We were able to customise our trip for birding, doing the normally two-day approach hike in a single day (and repeating this on departure), allowing us to spend all five nights either at Base Camp or on top, in the key areas for endemic birds and other wildlife. Anne hiking along an early section of the 22km approach trail. 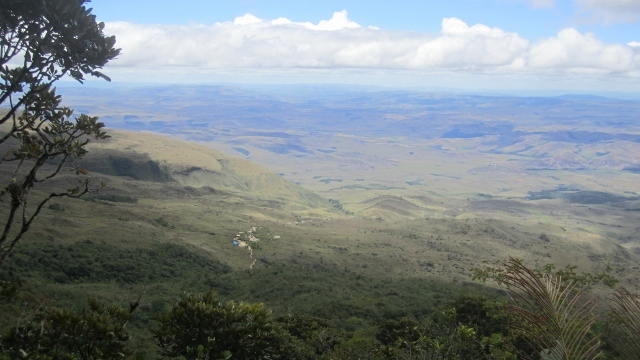 In the background are Kukenán-tepui to the left and Monte Roraima to the right. 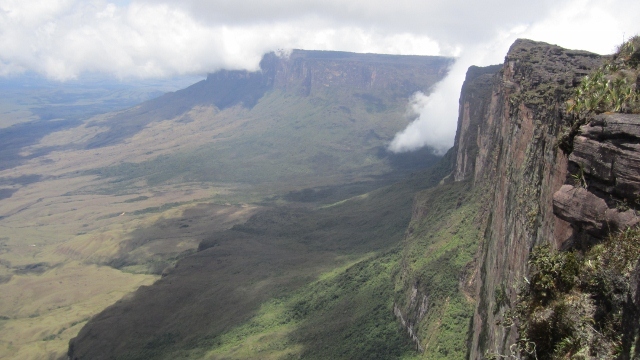 The origin of the name Roraima is unclear, but in one of the local indigenous dialects ﻿﻿is believed to mean “the Great bluey-green one”, presumably a comment on the appearance of the tepui in this typical distant view. As we reached the base of the hills leading up to Roraima, we had to cross the small Rio Ték and the larger Rio Kukenán, pictured above. On the way in, the flow in both was relatively low, but our return required a somewhat precarious crossing of Kukenán in relatively strong current with water up to thigh level. This northward view from base camp shows the forest that dominates the lower slopes of the monte, with its sheer 400m vertical face above and Kukenán-tepui behind on the left. Anne emerging after an afternoon nap in our well-sheltered tent at Base Camp. 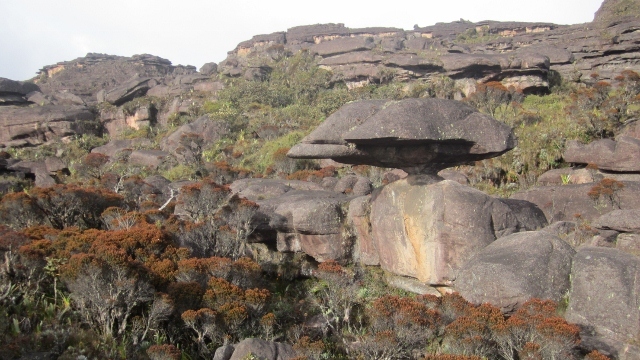 Due to the volume of hikers now reaching Roraima (about 5000 per year) some semi-permanent structures have recently been built at Base Camp. Despite those numbers, all of the 150+ people we met on the trail were (or appeared to be) younger than us: it is definitely a climb for those of above average fitness and/or above average motivation! 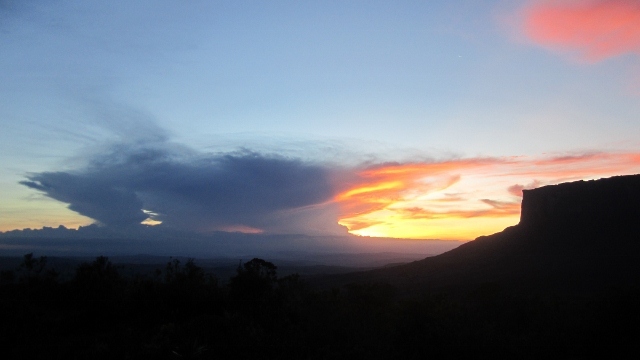 The views from base camp were spectacular in all directions, including this sunset storm over Amazonas to the west, with the southern end of Kukenán-tepui on the right. With a comparatively relaxed day of birding in the forests near base camp after the long approach hike day, the four hour, 900m vertical gain ascent on the third morning was not too difficult. 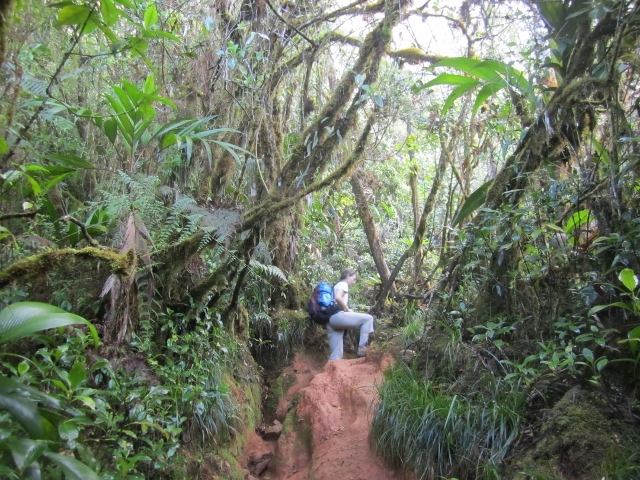 Much of it passes through lush cloud forest. 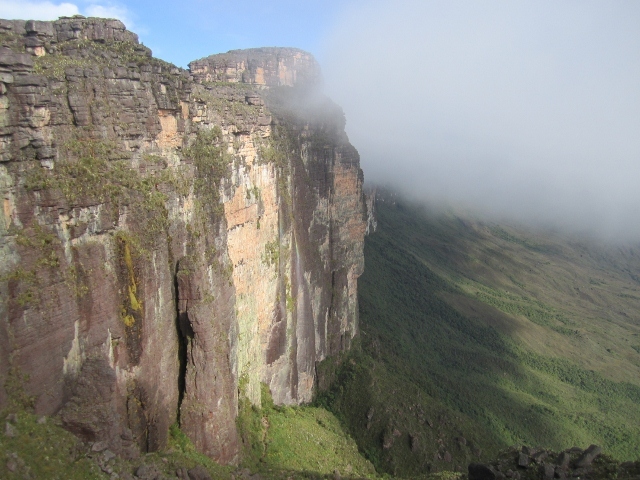 Bird species diversity is very low, but almost all the species are endemic to the tepui region, including several currently considered subspecies that are clearly distinctive, as-yet-unrecognised species. We found all of the birds we were searching for in this forest in a morning, including the lovely Greater Flowerpiercer and Roraiman Barbtail. The view back down to base camp (slightly left of and below center) from a mirador about a third of the way up the trail. One view from the trail where it reaches the base of the vertical wall, with the typical late morning cloud rolling in from below. 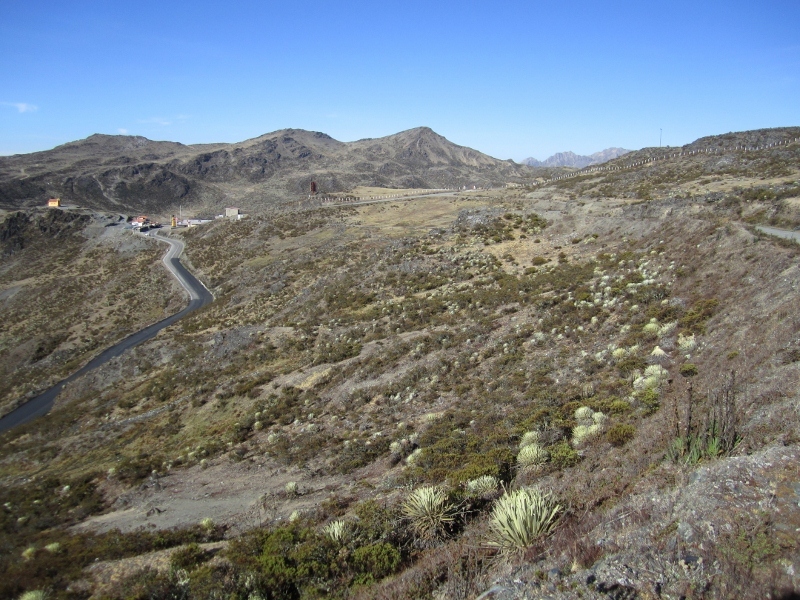 A view from near the top of the “ramp” at about 2700m (8900 feet) elevation, the final part of the climb. If you look closely at the area immediately below the palest part of the wall, you can make out a section of the trail we had just ascended. Base Camp is just off the image on the slopes to the right. 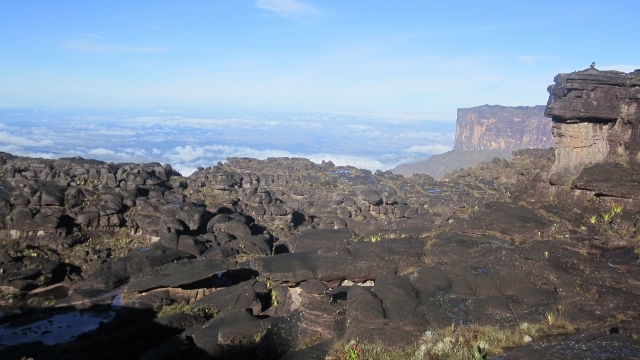 The unique geology on top of the tepuis was the inspiration for Arthur Conan Doyle’s The Lost World. 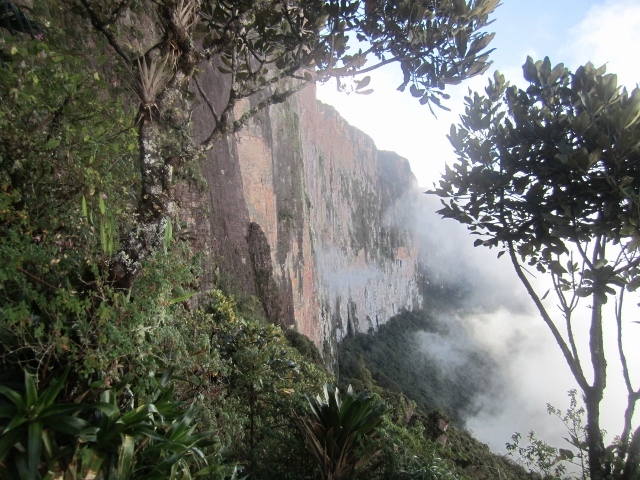 In the extreme environment, with exceptional solar radiation and wildly swinging temperatures, almost every plant and animal is unique to the tepuis, and many organisms are even unique to individual mountain tops (but rarely the much more mobile birds). 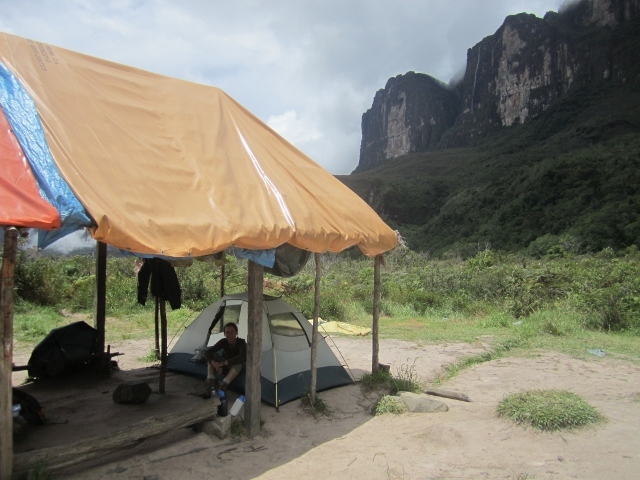 Our camp on top of Roraima for two nights at “Hotel Basilio”. 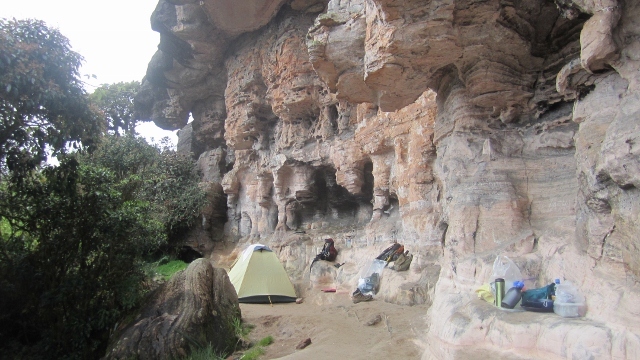 About ten caves are euphemistically called “hotels”, offering a flatish surface for camping, and good wind, rain, and sun protection. Our little kitchen area in the foreground came complete with an active nest of Tepui Wren (endemic to the high tepui), with the adults constantly coming and going feeding large nestlings 7m up the cliff above our camp stove. Oreophrynella quelchii, endemic to the top of Monte Roraima. This fully grown individual was only the size of a thumbnail. 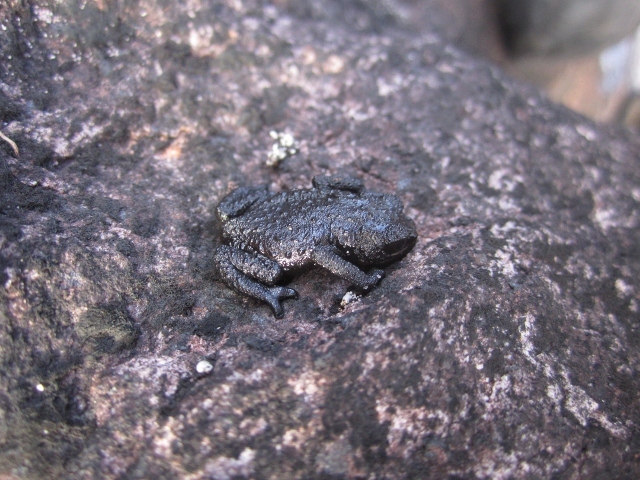 Oreophrynella is an ancestral frog genus endemic to the largest and highest tepuis, so well adapted to the exceptional environment that it has had little reason to evolve further. They cannot hop, but walk slowly. It is more closely related to African frog species than those in South America. 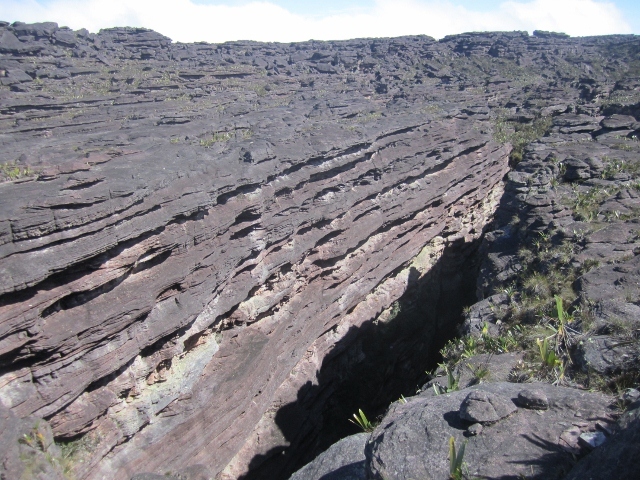 High concentrations of melanin - blackish pigmentation - are common in many of the organisms found on the tepui, as an adaptation to resist the intense solar radiation, while providing camouflage among the blackish tepui rock. Cueva de los Guacharos ("Oilbird Cave"). This spectacular slot canyon - only a few metres wide but plunging hundreds of metres deep - houses arguably the most impressive Oilbird cave in the World. Oilbirds are large nocturnal birds of ﻿﻿northen South America related to the nightjars, found by day roosting and nesting in caves. What makes this cave so unusual is that the sunlight penetrates the cave, giving superb views of the Oilbirds in the middle of the day. (We had previously seen the species in Colombia and Trinidad, but it is not the same seeing them - and somewhat disturbing them - by torchlight inside a dark cave.) 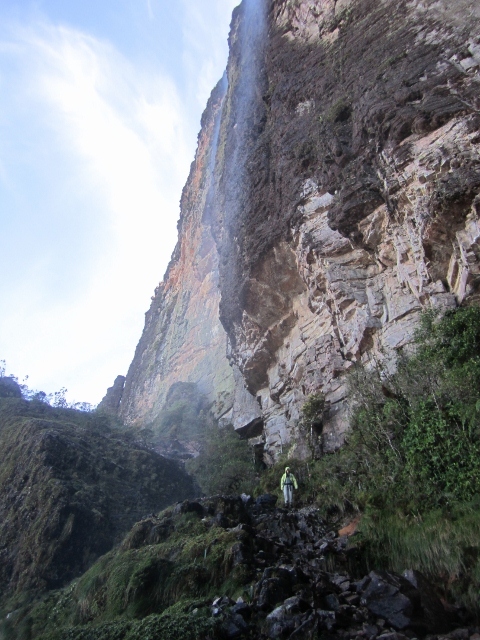 We saw hundreds in Cueva de los Guacharos, but there may be several thousand, as no-one knows the depth of the canyon, and the birds continue on the "shelves" as far as the eye can see (as you hang precariously over the edge) down into the depths. The flora of the tepuis is remarkable. Above, an Ultricularia, colloquially known as a pitcher plant. 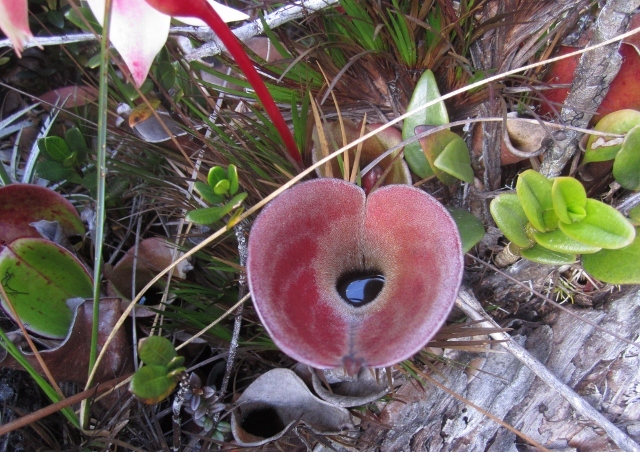 This carnivorous plant is endemic to the tepuis, and gets nutrition from digesting insects trapped in the liquid in its leaf roll (its flower is the pink one just visible on the long stem to the left). 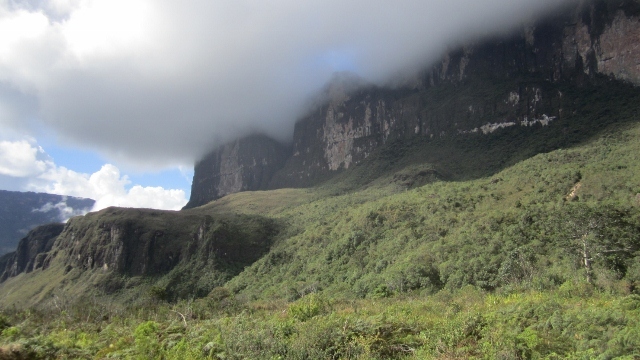 Many tepui plants are carnivorous, believed to be yet another exceptional adaptation to an extreme environment. Below, Stegolepis guianensis. 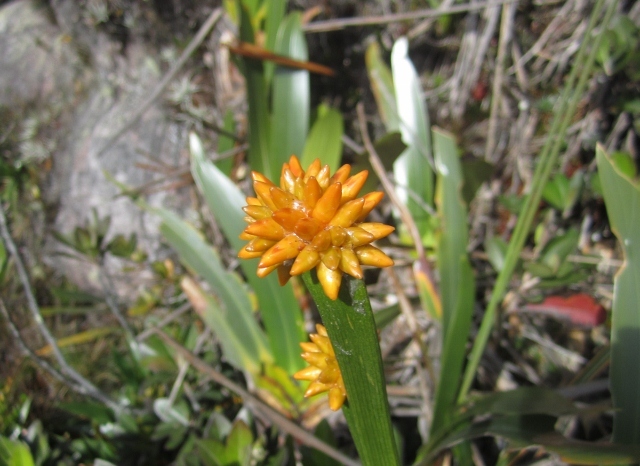 This genus is endemic to the tepuis, and is a member of the Rapataceae family found in Africa, further demonstrating the ancient link that the tepui represent between the once-connected continents of South America and Africa. If you are lucky, as we were, and have fine weather, the views are spectacular in every direction. You frequently have the sensation that you are looking down from an aeroplane window! 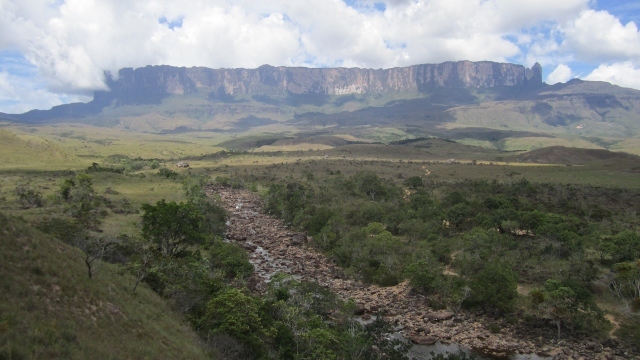 Above, the south face of Roraima-tepui, with La Gran Sabana stretching away into the distance. Below, the dawn view from our “hotel”, with Kukenan-tepui in the distance. Overnight drizzle had augmented the many waterfalls coming off the tepui. After a couple of days on top, Anne descends in her waterproofs despite the lovely weather, as we had to pass under two active falls coming from the cliff face some 200m above. Our final dusk view from Base Camp on a rare clear evening. The V-shaped cleft in the middle of the wall is the mouth of the Cueva de los Guacharos, the Oilbird cave, which we had seen up close from above.